Berries in general are expensive in this part of the tropics. A cupful of raspberries, blueberries or blackberries goes for a sweet S$9.90! Which is positively sinful, don't you think? Last week, the gods of berries deigned to reduce the prices of blueberries by half. And since I prefer my fruit cooked, I figured I might as well take advantage of the offer and pick up a pack of the inky hued fruit. In deciding what to do with them, I turned to my now trusty The Last Course by Claudia Fleming. I'd been meaning to try her Blueberry Cream Cheese Tarts with Graham Cracker Crust, but for the life of me failed to find a store that stocked the whole wheat pastry flour that the recipe calls for. I finally found it in Bangkok of all places, which I visited over the weekend, but that's another post for another day. I settled for Ms Fleming's Blueberry Corncakes instead since I had all the ingredients on hand. And they didn't disappoint. As the author describes, "these golden little cakes are absolutely irresistible". Made with almond flour, yellow cornmeal (polenta), butter and egg whites, these cakes turned out utterly scrummy in mini-muffin size as opposed to regular sized muffins, which were a tad on the heavy side. The recipe calls for a whopping two and two-thirds cups of icing sugar, which made them slightly sweeter than I would have liked. But other than that, they were a real winner. Leave them out for another day and they taste even better. The cornmeal seemed to have time to meld into the cake and leave less of a crunch. 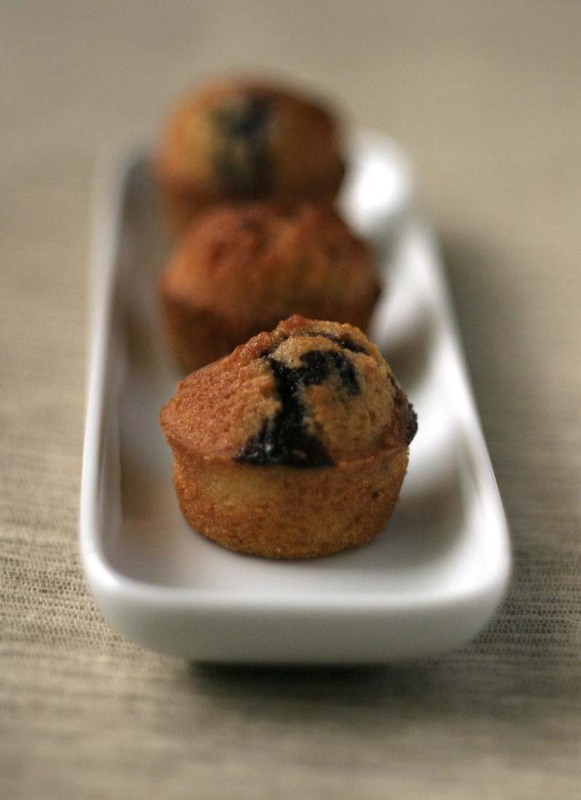 One of the best things about these beautiful little cakes are the blueberries scattered throughout the batter, which pop in the heat of the oven, intensifying their flavour and making wee pockets of jam within. They are a real tea time treat, though I ended up having them for breakfast and with ice cream for dessert after dinner as well. Sunday Times brought me here. You can get wholewheat pastry flour at Organic Paradise in Singapore. Three stores, out of which one is the warehouse at Pandan Loop. You can check out the store at Cuppage Plaza at Centrepoint, tucked away at a corner. You can see it from Keok Road. The other one is on Temple Street in Chinatown, behind the McDonalds at Lucky Chinatown. I get my bran, various types of flours and dried fruits and nuts from them. Prices are very reasonable, when you compared it to those upmarket shops. Great selection too. Turnover is fast so things are fresh. Enjoy! Love your blueberry corn cakes, it looks absolutely fresh and delicious. 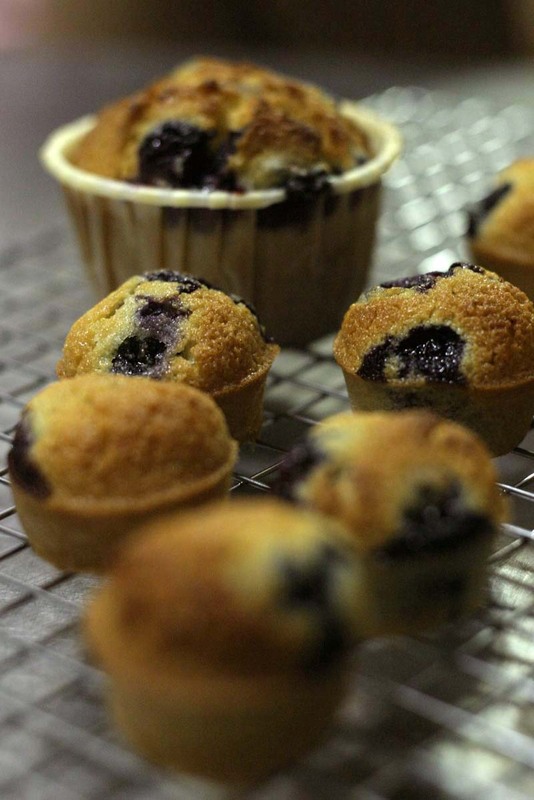 I used to make blueberry friands and love it too. Btw, do you know where I can get almond flour? I suppose almond flour is different from almond meal? Thanks for all the kind words guys :) I really appreciate it. Kimmy, almond flour is almond meal. Just ground more finely. When a recipe calls for almond flour, I usually throw the ground almonds into the food processor with some of the recipe's sugar or flour and blitz till it's as close to the texture of flour as possible. I love, love, love CF's blueberry tarts. You must try them. Another place that sells wholewheat pastry flour (I think the brand is Uncle Bob's) is Marketplace at Tanglin Mall. S, I'm working on those tarts as I speak. I just popped the pastry in the fridge for tomorrow morning :-) Thanks for the flour tip! looks fantastic. definitely better than my last try at muffins. great work! They look lovely! You are right, it is way too $$! You have to grow your own! Hello Eggy, I found out about your blog while reading the paper last week. Beautifully written and your pictures are really tempting. Your blog is going to be my daily read. Food writer, stylist and editor based in Singapore.